The Yellowstone Plateau hosts an active volcanic system, with subterranean magma (molten rock), boiling, pressurized waters, and a variety of active faults with significant earthquake hazards. Within the next few decades, light-to-moderate earthquakes and steam explosions are certain to occur. Volcanic eruptions are less likely, but are ultimately inevitable in this active volcanic region. 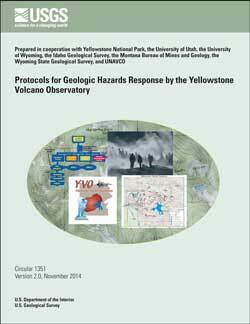 This document summarizes protocols, policies, and tools to be used by the Yellowstone Volcano Observatory (YVO) during earthquakes, hydrothermal explosions, or any geologic activity that could lead to a volcanic eruption. As needed, YVO will be an advisor within the National Incident Management System. The YVO Branch within the Plans Section of the Incident Command will consist of two prescribed groups (Monitoring and Information). The two groups and their subsidiary teams form a scalable system to respond to a variety of scenarios of geologic and volcanic unrest. The YVO response will be led by the YVO Branch Chief (also known as the Scientist-in-Charge) with the assistance of group supervisors and team leaders. Formal alerts and information statements will be issued by the U.S. Geological Survey (USGS) in conjunction with YVO member agencies and through standard telephone and Internet “calldown” lists. External communications will be coordinated by the public information team leader, in association with any Joint Information Center set up through the Incident Command. Internal communications will be handled through a computerized log system that can be used as an archive for public and non-public documents, and to provide a forum for discussion by observatory personnel and collaborators. The response plan will be evaluated and updated every three years by the observatory and will be available through the YVO and USGS public websites. The calldown list will be updated at least once per year and placed on the internal log system. Yellowstone Volcano Observatory, 2014, Protocols for geologic hazards response by the Yellowstone Volcano Observatory (ver. 2.0, November 2014): U.S. Geological Survey Circular 1351, 16 p., https://dx.doi.org/10.3133/cir1351.